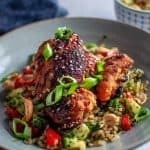 These Sticky Asian Glazed Chicken Thighs are oven baked, packed with flavour and require little effort. They are tender and moist, sweet, spicy and sticky with a delicious golden caramelisation on the outside. Perfect for an easy weeknight dinner. 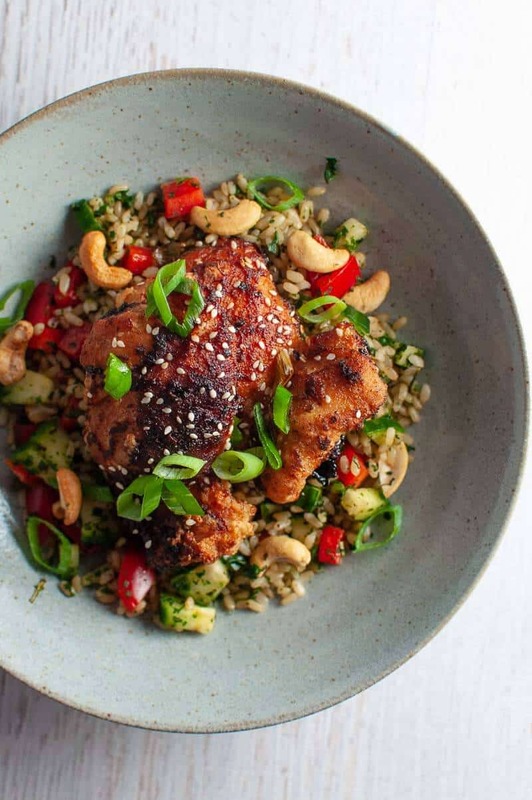 What Is Sticky Asian Glazed Chicken? 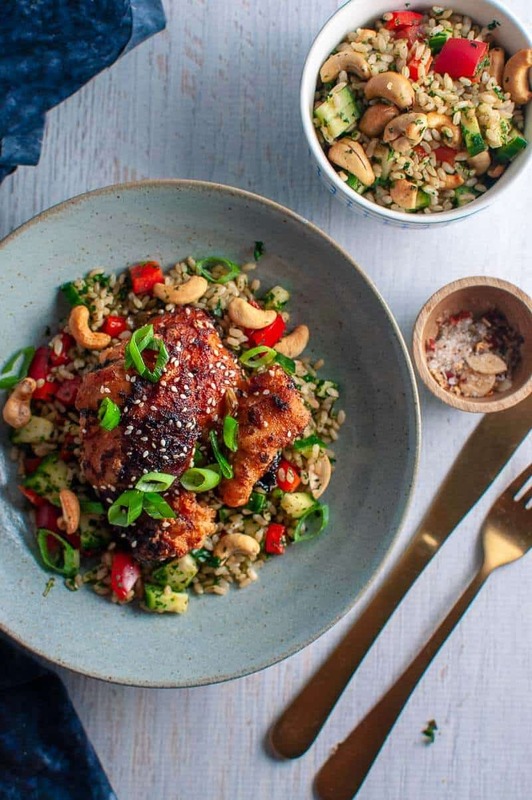 This delicious Asian inspired dish creates juicy chicken with bags of flavour, making it very moreish yet super simple to made. 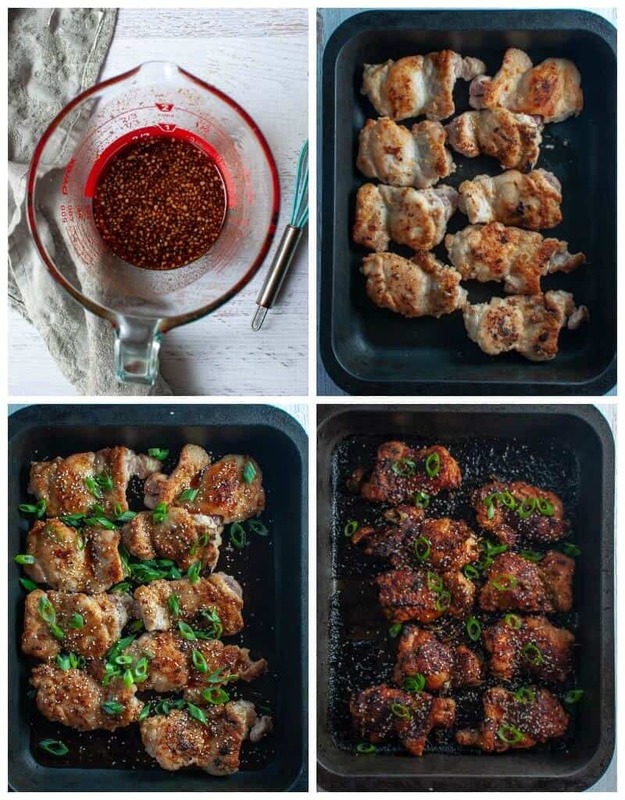 The chicken thighs are browned off on the stovetop in a pan and then transferred to a baking tray where the sticky Asian marinade is drizzled on, allowing them to marinate and cook fully through until they become dark on the outside and juicy and tender on the inside. I think sticky asian glazed chicken is best made with Chicken Thighs as opposed to chicken breast as thighs tend to hold in more moisture when baked. Is Pre-cooking the Chicken Really Necessary? Pre-cooking the chicken thighs on the stovetop allows a nice golden colour to develop on the outside, whilst inside they are still uncooked. Pre-cooking speeds up the cooking process in the oven so you can eat them sooner. Pre-cooking might mean an extra dirty dish, but it is worth it as the precooking helps to develop and lock in the flavour of the meat. COLOUR – FLAVOUR – EAT SOONER! 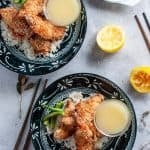 The sticky Asian marinade consists of 7 different ingredients. There are the usual Asian suspects, but you might also be surprised to see hot paprika and sweet paprika powder in the list which of course are not generally part of Asian cooking. I added these two additional spices for a little extra punch and dimension. You can omit them if you’re not a fan of paprika, but I highly recommend including them as they add incredible depth of flavour to the dish. Here’s what you’ll need to make the marinade for this delicious spicy sticky chicken. Whisk all the ingredients together while the chicken thighs are browning in the pan, and you’re halfway there. *Note: I use Manuka honey that has not been processed. You can buy it online here, and sometimes I’ve found it at Woolworths Supermarkets in Australia. Use half of the marinade in the cooking process, and use the other half as a finishing sauce (I spread it over very liberally with a brush, but pouring is fine if you don’t have a brush). This really intensifies the flavour and it also soaks into whatever you’re eating it with. I make herbed rices all the time and I love packing them with different nuts, needs, and whatever veges I have on hand. Even frozen ones. 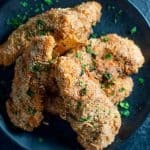 The great thing is once you’ve made a simple herb rice for this baked sweet and spicy chicken, you’ll be able to have it with so many other things, from steak, to meatballs, and even curries and stew. To get together the rice as quickly as possible and with the least amount of effort, I use the packet precooked rice that just requires a minute or two in the microwave. Add all the ingredients to cooked rice and mix to combine. The combination of mint and coriander are classics in any Asian recipe in my book, and I love the freshness it creates, the cashews add a lovely texture and crunch, and the cucumber is cooling and refreshing. This is spicy sticky chicken that you’ll want to get your hands on. Whilst on a basic level, you might think that it’s just chicken and rice, and of course it is, but that’s what makes it so great. 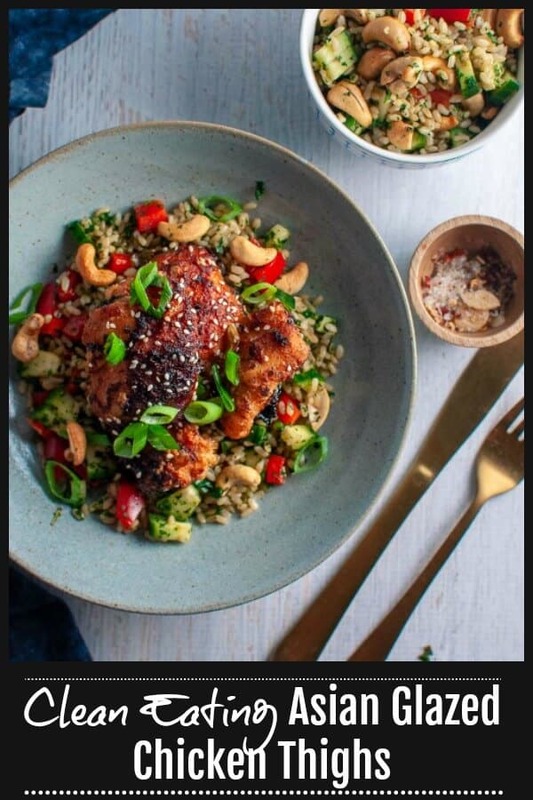 It’s a basic everyday meal dressed up to be baked sweet and spicy chicken with brown herb rice. 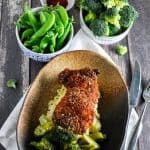 This dish is low fat, and very filing, makes for great leftovers for lunch the next day and you can use the Asian marinade in stirfrys and as a glaze over salmon. It’s a versatile recipe for easy weeknight dinners. 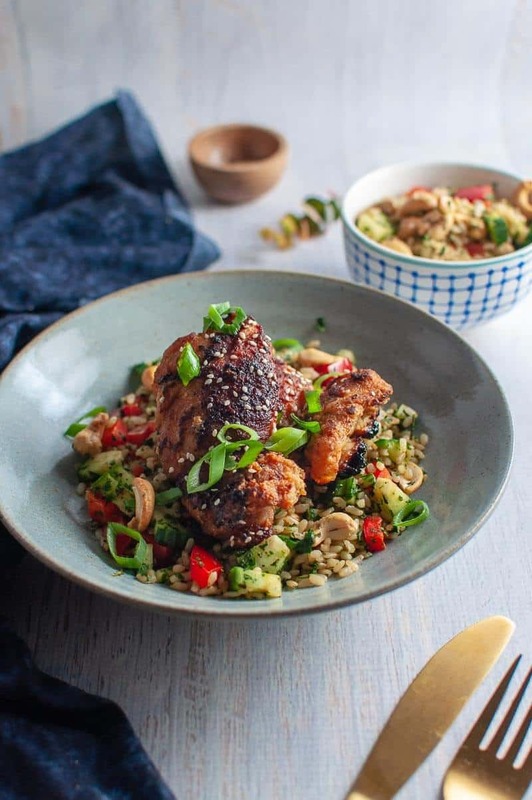 These Sticky Asian Glazed Chicken Thighs are oven baked, packed with flavour and require little effort. They are tender and moist, sweet, spicy and sticky with a delicious golden caramelisation on the outside. Preheat oven to 180 degrees C (Fan forced) or 320 degrees F.
Heat a large pan on the stove on high heat, add the oil and brown the chicken thighs off making sure to get a good amount of colour all over. In a large oven roasting tray, place all the chicken thighs. Asian Marinade: In a bowl, add all the marinade/glaze ingredients and whisk until combined, and drizzle HALF the over the chicken thighs. Heat the remaining sauce in a pot on low heat for 5 minutes, then set aside. Meanwhile, make the herb rice: add the cooked rice and all ingredients to a bowl and mix together. Serving Up: Divide rice equally among plates, and top with chicken, sesame seeds and shallot. Drizzle over remaining sauce from the pot that was heated on the stove. Add a squeeze lemon if desired.